Escape Velocity is coming out of orbit. This is our last night at sea before we arrive in St. John. It’s been a frustrating day. Our wind, which the Ocean Prediction Center unfailingly told us would be from the east, went south on us. 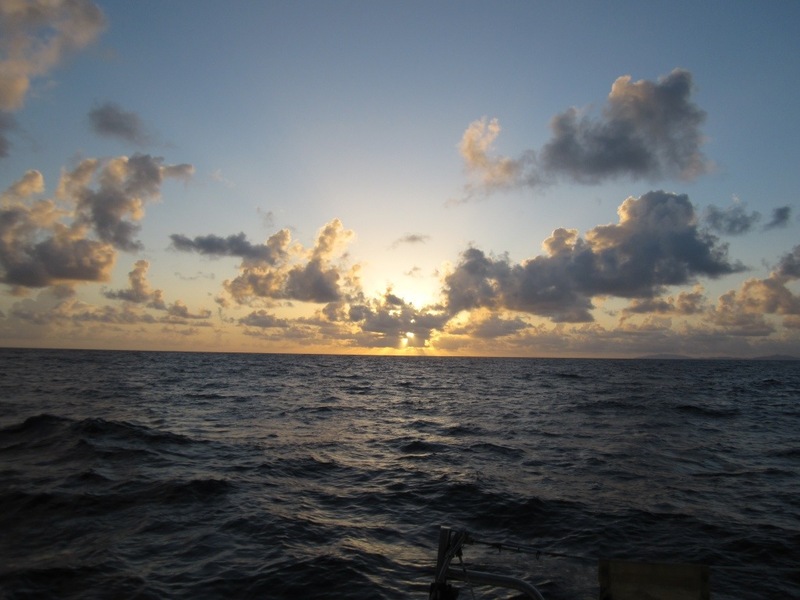 Our only option was to motor and we did some calculations and determined how fast we should go so we wouldn’t arrive in port before dawn Thursday. Everything was working perfectly so Jack went to his off-watch nest for a nap and I decided to take a bath. If you remember, the watermaker packed it in a few days out so showers have been off limits. We’ve kept ourselves reasonably clean with a combination of sponge baths and baby wipes but I really needed to scrub up. I used a technique I perfected on Stan’s boat, which had no shower. I filled a 2-quart jug with water, took it and a bowl and my soap and washcloth out to the cockpit. The seas are still too choppy to make standing up safe so I took my clothes off and sat down at the cockpit well where there are drain scuppers. First I washed my hair with my head hanging over the well, then I poured a little water into the bowl and used it to scrub myself with soap and washcloth. Finally I rinsed by pouring the rest of the bottle of water over the soapy bits. I know some people wash in salt water and do a fresh water rinse but I’ve never felt like I got all the salt off so this works better for me. Anyway, I was just finished when an alarm went off. We get alarms all the time — system alarms, GPS fix lost, AIS data lost — but this was the dreaded autopilot trip alarm. Sheesh, after 11 days it decides to stop working? 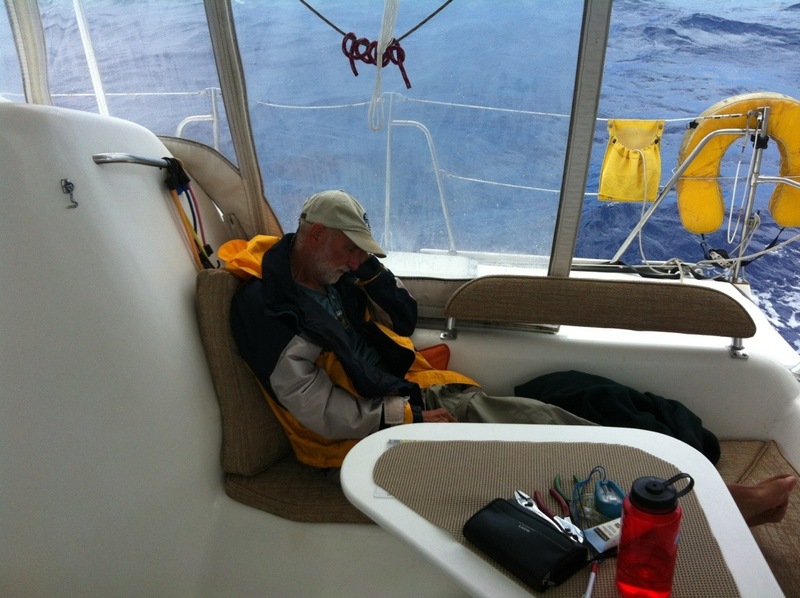 I wrapped a towel around me and jumped into the helm seat which is where I sat hand-steering the boat until Jack woke up an hour and a half later and took over so I could get dressed. We tried everything to get the pilot back, turned it off for a while to let it cool down, changed a few settings. Sometimes it would hold for a while then trip again, other times it just wouldn’t go back on course. We tried to remember when it had happened before and it’s been a while. We wondered if it’s because the engine was running and producing current at the same time that our solar panels are also charging and the battery monitor is already flashing FULL FULL FULL FULL. Well sure, we’d love to be sailing instead but the wind won’t let us. Aw, what the heck, we’ll sail for a while in whatever direction we can and see if that’s the problem. Sure enough, we switched the engine off, turned temporarily toward Puerto Rico and Mr. Autopilot steered beautifully. Hmmm. We decided to just enjoy the sail for a while, even though we weren’t heading towards our goal. After a few hours we reluctantly turned back into the wind and — so far, so good — the autopilot held. By 5:00 we knew there would be no more sailing this trip so we furled the main in Jack’s Rube Goldberg complicated line set up because as you remember the electric winch is kaput and there’s something blocking us from using a manual winch handle in it. Jack led the furling line under the port panel of the cockpit enclosure, across the side deck, through a turning block, back across the side deck behind the back rest to the spinnaker winch where he hand-cranked the big heavy main down while I tensioned the halyard. We were both a little tensioned by the end of that ordeal, but the main is safely furled and just don’t expect it to get raised again until we fix the electric winch. It’s on the list. We celebrated our last passage night by actually cooking: black bean burgers and cole slaw. It’s the best we can do in unsettled seas. It’s now 11:45pm. We decided on shorter watches in case the autopilot stops working again. It’s very tiring to hand-steer a compass course at night and neither of us can do it for five hours so it’s three on, three off, times two. For the first time this trip I can see multiple ships out there. One of them the AIS tells me is Oasis of the Seas and it’s huge and lit up like a mall at Christmas. Jack just came up for his second shift so I’m off to nap for three hours. Like most women I love shoes. But I don’t love most women’s shoes. I love my Chuck Taylor All-Stars in pumpkin and lime and black leather and the plaid ones for the holidays with the jingle bells on the tongues. I love my cowboy boots. I love my Timberland hiking boots and my Keens and my running shoes and my three pairs of Crocs and my espadrilles. I love my flipflops. I love all my shoes but the one thing I don’t love is wearing them. I’ve been kicking my shoes off at every possible opportunity for as long as I can remember. Wherever I live, the last thing I have to do before I go out is look for my shoes, which could be anyplace I happened to have finally had enough confinement and stepped out of them. My mom had odd ideas about shoes. She had it set in her mind that a child must be shod in heavy protective boots before he or she was ready to take those first steps. So here you are at about a year old pulling yourself up to a standing position and reaching out to Daddy and you’ve got to lift the half-pounders tied onto your tiny little feet, leaving you no flexibility to work on balance. Sometime after I learned to walk, which I managed to do despite the “walkers,” my mother was convinced by someone that I needed to wear “corrective” shoes because my left foot toed in. I spent the next five years of my life wearing a kind of proto-Doc Marten model of ankle boot that would have looked a little punk if it weren’t for the plaid dresses and bad home perms. Eventually I must have protested enough that I was allowed to wear normal shoes, if what you call normal is Buster Browns. It was many years before my sister and I were permitted to wear sneakers because Mom was sure our feet would “spread.” I thought this was an odd concept and took to pointing out that people had run barefoot through the forests and fields of the world long before shoes were invented but she was not swayed. So I just kept kicking off my shoes whenever I could. And my left foot still toes in. Jack, on the other hand, loved to wear his shoes. Tightly tied. At all times. His shoes came off only when he was sitting on the edge of the bed ready to retire. Even his boat shoes are the three-grommet style because he likes to feel his feet securely bound. My mom loved him, by the way, but I can’t say for sure if it’s because of a shared philosophy of shoes. We were married on the bow of a boat under sail and even then he was rubber-soled and sure-footed. I of course was barefoot. Then we moved aboard EV. I watched as Jack occasionally made it all the way through breakfast without putting his shoes on. Then he made a deliberate decision to try and be on the boat without shoes, especially since most boat owners ask you to leave your shoes on the dock or on deck before boarding. He says that first week was brutal and the bottoms of his feet felt clubbed. But he stuck with it and now he kicks his shoes off in the cockpit as soon as we get back onboard. Plus, the arthritis in his big toe he used to complain about seems to have up and left. Yep. That’s life on a boat. And I, a shoe-shunner, have found my proper home. Nearly two weeks straight without shoes — or a bra. It’s a kind of heaven.